Camo Decal Vinyl Sheets MATTE FINISH 12"x12" - 12"x96"
Lilly Pulitzer Prints/ Matte Finish Vinyl Sheets in 12"x12" and 12"x24"
thesignmanvinylgirl has no other items for sale. 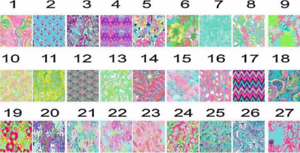 Details about Lilly Pulitzer Prints/ Matte Finish Vinyl Sheets in 12"x12" and 12"x24"
- Select - 12"x12" 12"x24"
There are 2,755 items available. Please enter a number less than or equal to 2,755. Fast shipping, product as described, recommended seller! Perfect! Exactly as described! Fast shipping! Ty so much!